If you go into the bush today, you’re in for a wonderful surprise. Our National Parks and Reserves are currently putting on spectacular spring display. A multitude of stories await discovery by those who care to seek them out. It’s mid-October and the spring is well underway. The days are getting warmer and the evenings longer. Bees are abuzz, gardens are in full bloom and if you tend to a veggie patch you may even be enjoying your own snow peas by now. Spring is a period of great activity in the natural world. As such it is the perfect time to observe what is happening in your local bushland reserve. Winter rains set the stage for what’s to come. Should rain be plentiful, so too shall wildflowers. 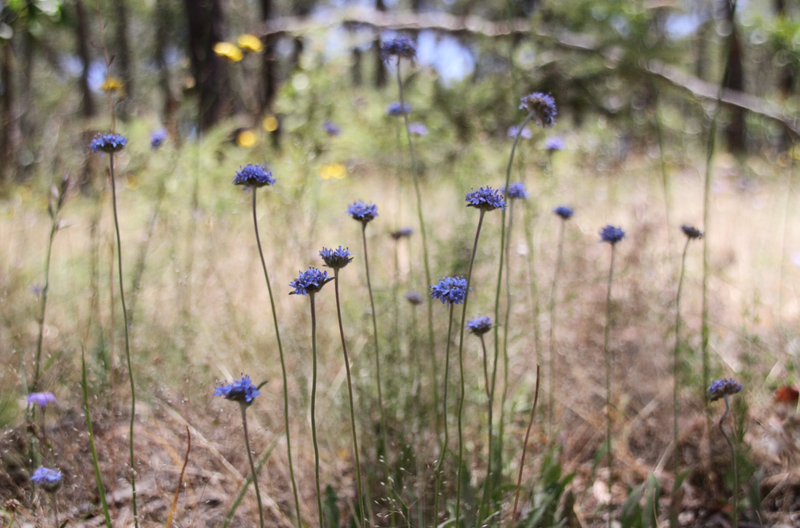 Should rain be scarce, wildflowers shall also be. 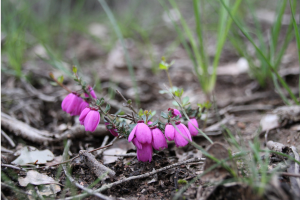 This year’s display contrasts starkly with that of the 2016 season, when a wet winter brought about a purple haze of Chocolate Lilies, hovering just above the forest floor. This year winter was relatively dry and as such far fewer wildflowers choose to bloom. 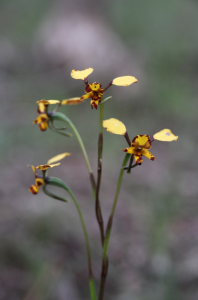 Nevertheless, a full palette of colour can be seen: Guinea Flowers with their profusion of bright yellow petals shine like beacons, Rice Flowers like patches of snow whilst a splattering Wedding Bells brighten the dull leaf litter. Delicate orchids arise from underground tubers. 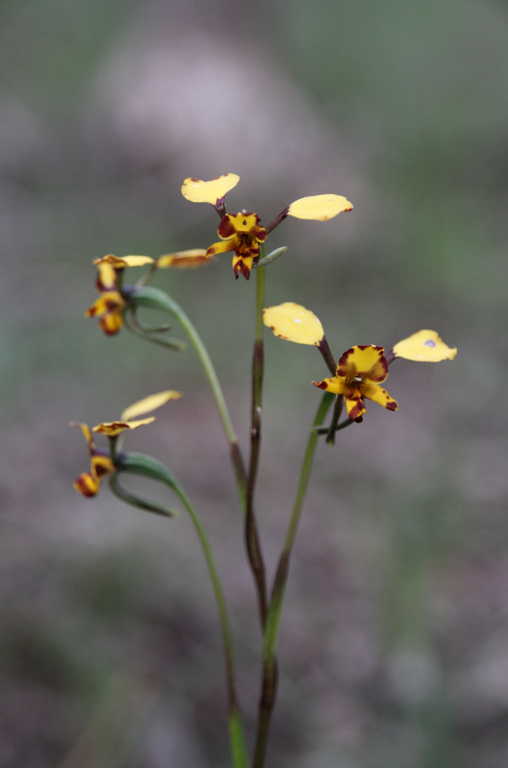 Like gems, they tend to be few and far between; a Leopard Orchid on a rocky rise, a Dwarf Greenhood in shaded depression. Before long these unusual flowers will shrivel in the heat and retreat to the soil once more. Even here they are not entirely safe though, as White-winged Choughs relish their starchy tubers and will unearth them if the opportunity arises. The blooming of wildflowers follows a orderly and predicable procession. Early Nancy kicks-off the wildflower season (around August) and Blue Pincushions, amongst others, mark its close (around December). Everlasting Daises, with their tough, wilt-resistant bracts persist into January. 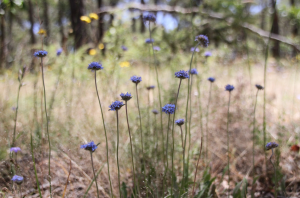 Different wildflower communities and climatic zones occur throughout Victoria, of course, resulting in different displays and timing variations. Just as the colourful wildflowers delight our visual senses so too does birdsong our audial senses. Rufous Whistlers – having recently arrived from warmer, northern clines – sing heartily throughout the day. The plaintive, falling call of the Horsfield’s Bronze Cuckoo can also be heard. His arrival marks the beginning of spring and for some unfortunate Blue Wrens and honeyeaters, a lot of hard work (as this wily bird chooses to deposit its eggs in another species nest, abandoning its parenting duties). 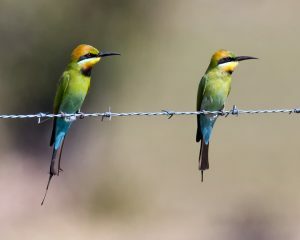 Later the Rainbow Bee-eaters and Sacred Kingfishers will arrive, having also migrated down from warmer, northern clines. These industrious birds excavate tunnels into eroded creek banks to form their nest (the latter sometimes also uses tree hollows). And then there is the background goings-on of the regular residents: Wood and Black Ducks with their large clutches of ducklings, Masked Lapwings and Magpies with their territorial swooping as they defend their nests and Grey Shrike-thrushes with their melodic tunes. So don’t miss out on this marvellous show. Awaken your senses, channel your childlike curiosity and get out into nature to discover the myriad of wonders awaiting you.